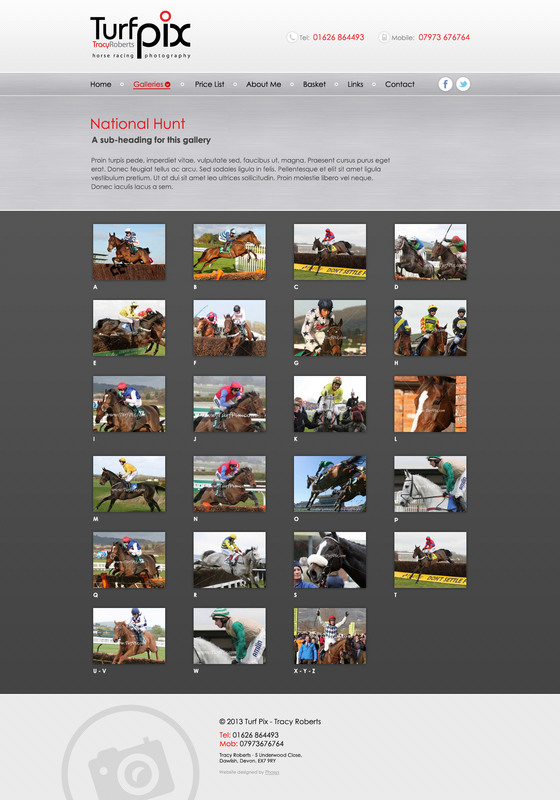 Tracy needed a fresh new website to display her portfolio and offer clients a proofing area containing dozens of galleries covering racing events across the UK. The website would be first and foremost simple and easy to navigate, with a special emphasis on the client galleries – these would use a ‘sub album’ system whereby galleries are nested one within another. The purpose of the sub galleries is to make the browsing experience quick and easy for the visitor. The website is designed to match with TurfPix’s current red and black branding – but we introduced a number of elements to soften the overall look and feel. Strong red and black are intense colours and use is best kept to a minimum to prevent the feel of the site from dominating the pictures. In the same vein using full black on a pure white background also comes across as stark (after all, it’s the colour combination with the most contrast). This can often be used to great effect – some of the best websites we’ve produced have used this theme – but in the case of Turfpix we felt that a more softened approach would work better. We therefore broadened the palette to include a range of greys – very light, medium and dark. We also developed a complimentary series of subtle textures to add to the coloured backgrounds. Textures are a great way of breaking up solid colour – it makes things a bit less bland and flat. When you have a strong red like the one in the TurfPix logo it’s a great excuse to use as a highlight colour – one that’s used to draw attention to elements on the page. The most obvious use of a highlight colour is to indicate ‘clickable’ things – links, buttons, etc. Because strong red contrasts so well with whites greys and blacks it does a great job of drawing the eye and leading the visitor to important headings and parts of the site especially deserving of attention. 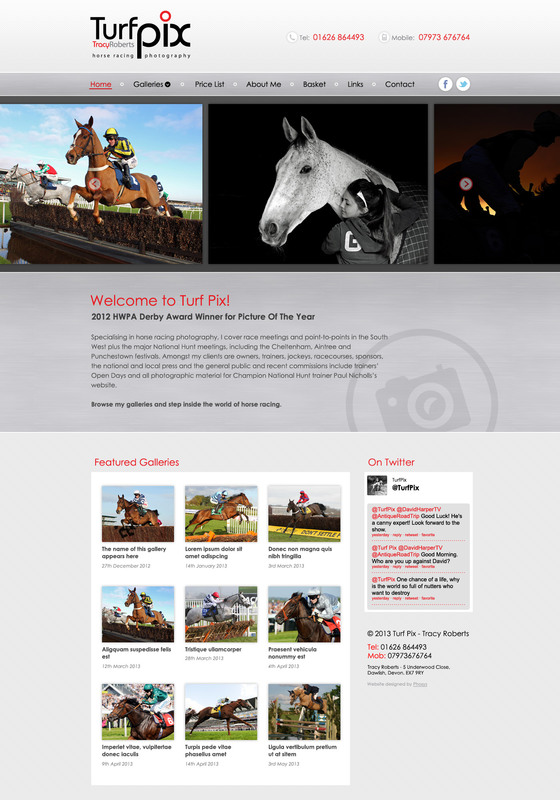 TurfPix utilises a ‘full width’ slideshow on a number of pages – the main purpose of which is to broaden the site and keep the visitor entertained. For the most part the rest of the content is fitted into a neat traditional column which allows us to precisely line up the content and keep things neat. A key feature of the site is the Galleries section – a drop-down menu and a series of sub-galleries provide a way for Tracy to clearly divide up her events. This obviously makes life easier for those riders who are keen to find their photos – the larger events are subdivided into alphabetical galleries where riders can search for their surname. We implemented a search indexing system for TurfPix – images within the galleries are tagged with extra data containing useful information (such as the name of the horse, jockey or trainer). Visitors can then search for their photographs using a search box at the top of the page. Clicking a photo provides an enlarged (and watermarked) version of the image and also a menu for customers to buy prints and other photographic products.